Hyperammonemia - When should we start dialysis? I would like to discuss a case that I recently saw in renal consult. He was a man in his 60s with history of end stage liver disease who received a liver transplant. His hospital course was complicated by anuric ATN and liver graft failure. As a result, he was started on dialysis on post-operative day 0. Dialysis was stopped on post-op day 2 due to recovering renal function. On post-op day 3 he became encephalopathic. His ammonia level was elevated to 337 and did not improve with conventional therapy with lactulose/rifaximin. The question was whether to start dialysis or not in spite of his recovering renal function. Causes: The urea cycle in the liver in which ammonia gets converted to urea is responsible for excretion of waste nitrogen. Hyperammonemia in newborns is most commonly associated with inherited disorders of amino acid and organic acid metabolism. Causes in adults include Reye’s syndrome, liver failure, sepsis especially infections with urea splitting organisms, high dose chemotherapy, drugs (salicyclates, valproate), gastrointestinal bleeding, multiple myeloma, parenteral nutrition and late onset of urea cycle defects. The latter usually presents with episodic encephalopathy precipitated by metabolic stressors like infection, anesthesia or pregnancy. When to start dialysis? There are no published guidelines for when to initiate dialysis in a patient with hyperammonemia due to urea cycle defects. 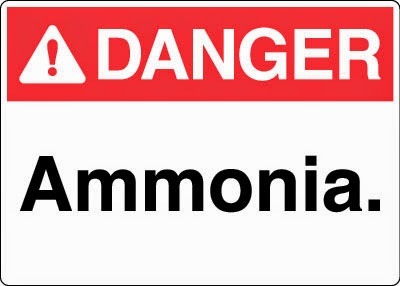 It is commonly indicated if the ammonia blood level is greater than three to four times the upper limit of normal or greater than 200 micromoles/L. Continuous hemodialysis is started with higher flow rates and is the most effective treatment in rapidly reducing ammonia levels. Even though ammonia is osmotically active, the rapid removal of ammonia is not associated with disequilibrium syndrome mainly due to two reasons: First, there is a rapid equilibration of ammonia across the cell membrane. Secondly, the total amount in the blood, even in severe hyperammonemia, is only about 200 micromoles. This contributes less than 1 mosm per liter to total osmolality and therefore, even if it were all removed at once, the change in osmolality is too small to make cause disequilibrium. Contrast this with ammonia levels in the urine which are typically in the millimolar range. The question remains whether to start dialysis in the setting of acute severe hyperammonemia (levels > 200 micromoles/L) and encephalopathy in adults with liver failure and normal kidney function. I was not able to find any literature on it and would like to know what the practice in other institutions is? I believe since severe hyperammonemia can lead to irreversible brain damage, dialysis should be instituted. See this previous post concerning hyperammonemia in individuals with myeloma. The following few posts are a summary of tick borne illnesses that can cause renal failure and/or electrolyte problems. First identified on Nantucket Island in 1969 and was initially know as Nantucket fever. Cases have been reported in Europe (Croatia, France, Great Britain, Ireland, Portugal, Spain, Sweden, Switzerland)(Babesia divergens). Ixodes scapularis. The Blacklegged tick. Humans are not a natural host. Infection by blood transfusion has been reported. Haemolytic anemia, thrombocytopenia, renal failure, transaminitis. Treatment - Atovaquone plus azithromycin or quinine plus clindamycin orally for 7 to 10 days. Atovaquone plus azithromycin is preferred as this combination is better tolerated. The source for this review is mainly from the CDC website as well as various references cited in the posts. 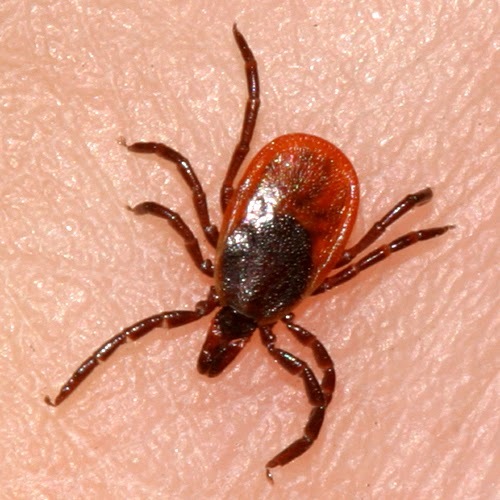 The tick pictures provided may differ from what might be found on a bitten human. 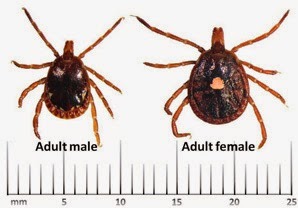 Ticks become larger and engorged after feeding and will look different. Recently a 65-year-old female was referred to an ED in the state of Missouri complaining of fevers, chills, headache, diarrhea and vomiting occurring over the last week. 3 weeks prior she had received an orthotopic liver transplant. Her post transplant course was unremarkable and she was discharged on prograf 2mf bid, myfortic 360mg bid, prednisone tapering, Bactrim single strength daily and valcyte 450mg od. She also took thyroid replacement, Januvia, warfarin and aspirin. Past medical history included diabetes, heart failure, dysfunctional uterine bleeding, hypothyroid and PUD. She also had CKD with a creatinine about 1.4mg/dl. On examination her Temp was 38.6, HR 110, BP 113/76 and O2sats 99% on RA. She had no nuchal rigidity but reported a sore neck. She had an erythematous area on her lower back. The rest of her exam was normal. She had a normal CT brain and was started on multiple antibiotics in the ED. On further questioning her daughter reported removing a tick from her back after the patient went out looking at deer close to her house. Lets pretend the daughter brought in a picture of the tick (see above)! Lab trends; admission to discharge. No lumbar puncture was performed. To summarize, this lady had constitutional symptoms, fever, neurological symptoms, GI symptoms with a rash and a tick bite. She had pancytopenia, transaminitis, hyponatreamia and renal failure. Her antiproliferative medication and anti-infective medications were held (Myfortic, valcyte and Bactrim). Sodium and creatinine improved and potassium became low, likely due to GI losses. Interestingly her leucopenia followed the classical pattern of lymphopenia followed by leucopenia and she required G-CSF. Her transaminases were normal at the time of discharge. The first case of human ehrlichiosis was described in 1986. The two most important species to infect humans are Ehrlichia chaffeensis which causes human monocytic ehrlichiosis (HME) and Anaplasma phagocytophilum which causes human granulocytic anaplasmosis (HGA). Both of these diseases have the same vector and have very similar clinical and laboratory features. Ehrlichia ewingii is a less common cause of ehrlichiosis than Ehrlichia chaffeensis. Ehrlichiae are obligate intracellular bacteria found in membrane bound vacuoles in human and animal leukocytes. The most endemic area is the southeastern USA – ‘the tick belt’. See the CDC map for the endemic regions in the USA. Cases have also been reported in Europe, Africa, South America and Mexico. 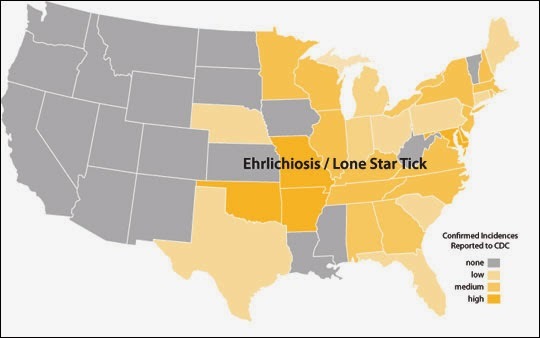 The lone star tick (Amblyomma americanum) is recognized by the CDC as the principal vector of Ehrlichia chaffeensis and Ehrlichia ewingii in the U.S.; both disease agents are responsible for causing ehrlichiosis in humans. White-tailed deer are a primary host of the lone star tick and appear to serve as a natural reservoir for E. chaffeensis. The lone star tick is also a vector of Francisella tularensis, causal agent of tularemia. Adult ticks parasistize deer, cattle, horses, feral swine, sheep, dogs, and humans. Most infections occur in the spring and summer in the USA. There has been a single case of myocarditis and multi-organ failure in a healthy adolescent. Most common triad is leucopenia, thrombocytopenia and elevated transaminases. Leucopenia. This tends to be caused by lymphopenia initially followed by neutropenia as in this patient. Usually by PCR methods. Note this test may not detect the recently reported third species, E. muris, found in Wisconsin and Minnesota. This can be a difficult diagnosis to make. It is clinically and geographically similar to RMSF. It can also present like mononucleosis, TTP, hematologic malignancy, cholangitis, the early phases of hepatitis A infection. This is especially so in immunocompromised patients whose clinical features may not be as obvious initially. Common transplant drugs such as Bactrim/Septra, valganciclovir, mycophenolate and azathioprine can also cause cytopenias. Doxycycline 100mg iv or po bid for about 10 days. Note this will also treat RMSF which is often confused with ehrlichiosis. Outcomes. Mortality is about 5%. Most commonly due to viral or fungal super-infections (Invasive aspergillosis, candida, HSV). This interesting case illustrates the difficulty in diagnosing tick borne infections. They can be lethal and severe in our immunosuppressed transplant population and can be a cause of renal failure in any patient. Also of interest in this case is the lymphocytopenic and neutropenic trending that is usually more peculiar to Anaplasma phagocytophilum which causes human granulocytic anaplasmosis (HGA). We did not test for A phagocytophilum as ehrlichae PCR was positive.